★Professional leather lined pressing edge. ★Smooth Control: This Gaming Mouse Mat made by super soft fabric, providing smooth platform for consistent interaction with your mouse sensors, which resulting in predictable control performance and precise aiming. You can always feel free to contact us if you have any problem for the product, we will reply in 24 hours and try our best to offer a satisfactory solution for you. Durable & user-friendly --- Pressing Edge with leather lined to ensure it will not fray or fall apart, silky Smooth and waterproof coating surface provides the optimal surface for gaming sensors and less resistance than other mouse pads. Perfect Large Size for Gaming --- 11.8 X 12.6 X 0.7(wrist rest) inch, the extended mouse pad offers space to slide your mouse to a larger area for pro-style gaming or completing business tasks. Ergonomic Design --- The Synthetic LEATHER wrist rest support helps you keep your wrist in a neutral position that reduces pressure and pinching of the wrist to prevent the Carpal Tunnel Syndrome. Many of our customers report reduced pain. 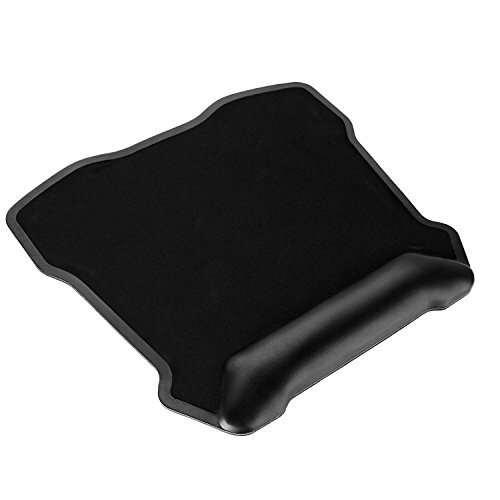 Humanized material --- High quality non-slip rubber [mouse pad gaming], provides heavy grip preventing sliding or movement of mouse pad. Soft and smooth --- Providing your mouse with precise movement,suitable for all types of mouse.